"Okay, okay, okay. Eating more is in no way a legitimate diet. So this is prob'ly not for you—I bet none of you ever..."
Smile-breaks columns, published in San Diego County’s many community newspapers as "Shenanigans," "Up Against It" and "Smile-breaks," over the years have been entertaining people since they first appeared in the Daily Californian in 1997. 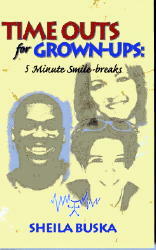 If you love Sheila’s columns, check out Time Outs for Grown-ups, 5 Minute Smile-breaks, a collection of earlier Smile-breaks—available for $10 plus shipping. And at the "Smile-breaks" tab you’ll find dozens of past and current "Smile-breaks," covering every conceivable topic. Sheila recommends you read them as needed! Paul’s World takes us into the mind and heart of Paul, who was born with cerebral palsy into a family of "normal" siblings. Paul’s unique personality exhibits many – but not all – characteristics of what, until recently, had been referred to as Asperger’s syndrome. 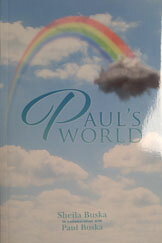 Paul loves people and having fun, but his lack of cuing into normal social skills has made "fitting in" a challenge. He meets that challenge with his outgoing personality, enthusiasm, and humor – winning friends everywhere he goes. Paul’s story of love, frustrations, and conversations with God as his counselor, as told interchangeably by Paul and his mom, is inspiring people from all walks of life to handle their own life difficulties with optimism and humor. This 140 page paperback book is just the right size to tuck in your pocket for those moments when you desperately need a break from the stresses of daily life. Sheila Buska's commentaries on contemporary life bring smiles as she tells about fighting ATM machines, computers, traffic, garden pests and strange relatives. You'll laugh as she kicks the vending machine, flies past the - oops! highway patrol officer - and sneaks out at dawn to charge a shovelbird in Wyoming.